My mother died at noon on the day before Mother’s Day. I had spent that Friday evening with her, arriving at the nursing home around six in the evening. She was sleeping, a ventilator across her face covering her nose. The noise of her breathing was the only sound in the room; it was a steady sound. I nestled my fourth finger into her right hand, securing her fingers around mine with my other hand. Her hand felt a little cold, but I Was certain that I could keep it warm. I watched her. It appeared to me that my mother would not give up till she was certain her job was done. I told her that we were all fine. That she had nothing to worry about. It’s done. You did it all. So well, too. Let go, Mom. I left around midnight, and returned early the next morning to the same steady sound. Around nine, my older brothers and sisters started arriving, and by noon all seven of us were there. We gathered around her bed, and my brother Tom, his own mother’s doctor, removed the ventilator. I remember one last gasp for breath, and then her silence. We recited the Our Father and three Hail Mary’s. We are Catholics. I struggle with the resurrection. I do believe in what this man Jesus had to say: his message speaks to my heart. But when the story reaches the point about the empty tomb and the risen Lord, I have doubts. It seems to me that the writers of this story made some stuff up. I can understand that they only wanted to help us by taking away the fear of death. But I often wonder if there is the need of a resurrection and the promise of an afterlife to dispel the fear of death. My mother told me, one day over lunch in the nursing home, that she was certain that when it was all over, you were just put back into the earth, and that was the end of things. My mother had an amazing track record for calling a spade a spade. 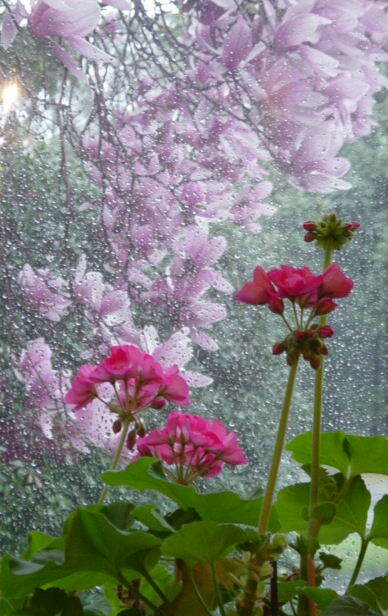 There was a small withered geranium on the window sill of my mother’s room in the nursing home where she died. I took it with me when I left that Saturday to drive back to my home in Virginia as I could not walk out that door to her room empty-handed. But I could not sleep that night either, for I could still hear her labored breathing. Then next morning my husband took our two sons to nine o’clock mass. I stayed home, as I knew I could not face anyone just yet. Besides, I had a lot to do. On Monday we were leaving early for the drive to northern New Jersey for the wake that night and the funeral on Tuesday. I got the boys’ clothes together and packed, and then looked in my closet and realized I had no black. I had black and white stripes, but no black. Mom was always pleased when I had something new on that looked good on me. From a very early age, I had known that this gave her pleasure. I would go get something good and black for her funeral. Anyways, by then I thought it might be good to get out for a while. There was a flower shop next to the first store that I went to. By now, it was around one in the afternoon. A little girl of about five emerged from the flower shop with her father. She wore an egg-shell blue dress that fell just below her knees and was softly gathered in the back with a string of lace. Her long, silky blonde hair hung down her back, and one hand was in her father’s while the other held a bouquet of flowers. She was having what looked like a serious conversation with her father about their next errand as they moved toward their car in the parking lot. That was when it hit me. This was Mother’s Day. I looked around and realized that the parking lot and sidewalk were full of men and children busily going about last minute shopping for their wives and their mothers. I took a deep breath, and went into the store. There was nothing good and black there, so I returned to my car. As I drove to the next set of stores down the road about a mile or so, I thought perhaps I had lost it, and should not be out and about on my own. This was crazy. But no, I reasoned, I really had to do this. I had nothing to wear to my mother’s funeral. The next set of stores was also full of the same last minute shoppers, so I concentrated on the job at hand. I had not taken the time to do that, as I just wanted to see if it fit. It did, so I told her I would take it. After I paid for it, I watched as she put a plastic bag over the suit so I could carry it home on a hangar. At the cash register, she had been trying to make some small talk with me, but I was not responding. As she handed the hangar to me, she tried one more time. She said it was a lovely suit, and asked if it was a special gift for Mother’s Day. I managed a smile, and said no – no special occasion. I remarked that it was a shame she had to work on Mother’s Day, and she replied that when she got off work that evening at five, her husband would pick her up and then their children would have dinner ready for all of them. She was smiling by then at just the thought of it. I told her to have a great evening, and walked out to my car. Then the thought occurred to me that what I had just done was a good thing. I could have said it was for my mother’s funeral, but then I may have ruined her Mother’s Day. No need for that. And then I realized that it was my mother who had taught me how to do that. What I’d just done. A good thing. That geranium has presided in my dining room window since 1998. I tend it regularly with loving care. Why are we mothers so concerned with the growing of flowers? Why do sweet little girls in egg-shell blue dresses bring bouquets to them every Mother’s Day? Could it possibly be that each spring, as the cold dirt of the earth is warmed by the spring sun, the flowers resurrect themselves? And could it possibly be that it is the world of our mothers in those flowers, their world that slipped into the grave with them, but which comes back in those vivid blossoms for those precious weeks of spring to remind us once again that we are here to do good things? Could it possibly be, Mom, that there never is an end to things?